Apple restores some games with confederate flags to the app store after deleting them all. 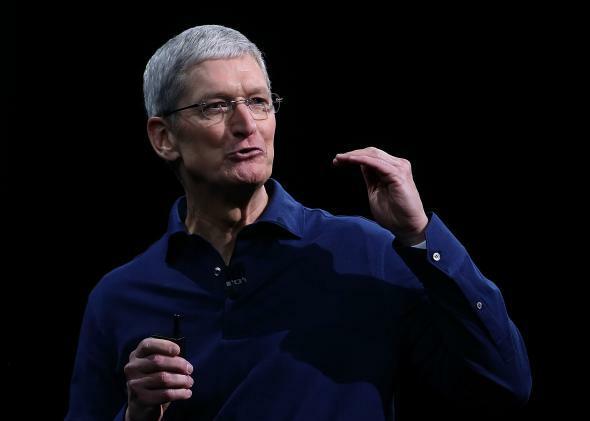 Apple CEO Tim Cook delivers the keynote address during an Apple conference on June 8, 2015. Shortly after the Charleston, South Carolina, shooting, Apple CEO Tim Cook joined those calling for the elimination of the Confederate flag. “Let us honor [the victims’] lives,” he wrote on Twitter, “by eradicating racism & removing the symbols & words that feed it.” This being Twitter, he offered no explanation of how he thought we could achieve such change. But there was little question of which symbols the Alabama-born Cook had: He was clearly thinking of one that flew at full mast over the South Carolina Capitol Complex, of the one the terrorist Dylann Roof flaunted on the plates of his car. When Apple’s response came—and it did within days—it was more than Hall could have hoped for, and likely more than he would have wanted. On Friday searching for “Confederate” produces far fewer results than Hall turned up, and fewer still feature the flag in any capacity. There’s a peculiar e-book edition of confederate president Jefferson Davis’ history of his failed insurrection. Another app offers information about the activities of a Civil War re-enactment group. Meanwhile titles such as Redneck Shooting Range are nowhere to be found. But the programs that concerned Hall aren’t the only ones missing. Thursday, on Touch Arcade, Tasos Lazarides reported that a wide range of less self-evidently troubling games had disappeared from the store, including a host of Civil War simulators such as Ultimate General: Gettysburg—“a tactical battle simulator that allows you to lead thousands of soldiers in the famous battle of Gettysburg as commander of either the Union or Confederate army.” For games, this was the Sherman’s March of flag removals: Everything had had to go, regardless of its degree of complicity in the vile culture Cook hoped to expunge. Apple is not, of course, alone in taking such steps. Walmart and other retailers pulled Confederate merchandise from their stores as flag sales boomed online. As Slate’s Ben Mathis-Lilley suggested, the spike clearly correlated directly with a larger culture of racism. In the case of games like Ultimate General, however, the flag’s image appears in the service of a representation of the past. Its mere presence in such titles does not implicitly endorse racism, and removing them may be tantamount to hiding the historical fact of racism instead of combatting its present persistence. Kyle Orland of ArsTechnica describes the removal of this image from games in particular as the product of a worrisome “double standard,” one that treats interactive digital entertainments as somehow more dangerous than other media. Orland points out that Apple still sells Civil War­–related films, books, and music, many of which prominently feature the iconography of the Confederacy. Apple has since promised to reverse some of these deletions, but the initial move is still telling. Games that feature the flag appear to be functioning as a scapegoat for Apple here. And as they always have been, scapegoats have more to do with forgetting our own sins—and our complicity in the sins of others—than with preventing new crimes. As the United States continues to grapple with its racist legacy, it will need to find ways to make sense of its past, but we do ourselves no favors when we occlude only the most convenient images of that history. Some research suggests it is possible that games can intensify existing forms of racism, especially under specific laboratory circumstances. And yet other studies propose that gaming can make us more social, turn us into better learners, and provide other benefits. Ultimately, causality is difficult to establish. It’s more telling that we keep carrying out such studies: The number of inquiries conducted on this topic testifies to a fear of video games more than it does to anything fearful that they accomplish. A similar suggestion of dubious causal logic underlies Cook’s comments on Twitter. In his formulation, “symbols & words” aren’t merely part of a racist culture that must be eradicated—they “feed” it. How nice it would be if things were this simple, if the Confederate flag truly sustained racism instead of standing for it. The danger of proposing a largely causal connection between the Confederate flag and racism is that it obscures the very real systemic roots of social ills. This doesn’t mean we shouldn’t carefully remove symbols of white supremacy, but it does mean that we shouldn’t trade in fantasies about the way those symbols work and what empowers them. The Confederate flag isn’t responsible for the Charleston massacre, a pervasive culture of racism is. And racism is much larger than its symbols.